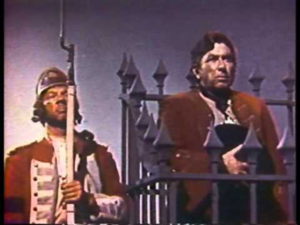 After the completion of 1954’s Long John Silver feature, though the film had a lukewarm reception at the box office, director Byron Haskin formed Treasure Island Productions and the cast and crew stayed in Australia to film twenty-six half-hour episodes of this TV show. Unusually, it was filmed in color, though color broadcasting was still a rare thing in the 1950s. By the time the series debuted in the U.S.A. in 1956, its star, Robert Newton, had died at the age of fifty from alcoholism, after returning to Hollywood for his final role in Around the World in 80 Days. Newton’s undeniable charisma notwithstanding, the show just isn’t very good. It’s unable to settle on a tone, veering from serious pirate drama one week to broad situation comedy the next, as Purity Pinker, the proprietress of the Cask and Anchor, tries to dry-dock Long John into matrimony. Half the time Silver is the rapacious scoundrel he is in the films, and half the time he’s semi-reformed and just sort of a con man, no worse or more ill-intentioned than Sgt. Bilko. Color film or no, the production values are low, the acting is weak, the dialogue is worse, and not even having a pint-size pirate with a hook in Silver’s crew is enough to save it. These be shoal waters, mates—steer clear. Copyright © 2019 Lawrence Ellsworth. All Rights Reserved.